This Jaguar XF is available in Silver, Black, White, Red, Blue other colours and lease options, subject to availability and includes a warranty. The Jaguar XF vehicle now packs more detailed exterior styling and upgraded interior, which provides the customers with even more of that sporty feeling blended with luxury character. The new cabin trim is derived from the top of the line XFR model and features leather sports seats, power-adjusted side bolsters, high-gloss Piano Black veneer and Jet Suedecloth headlining. In addition to the stunning visual improvements, the high-performance diesel also offers an Adaptive Dynamics unit, which is available as an option. Which Jaguar XF are you going to lease today? We offer top quality Jaguar XF from brand new, nearly new, slightly used or ex demo, whether you have good or poor credit rating, pay a low or no deposit. These Jaguar XF can be leased or financed and come with a warranty, HPI checked and when contract hire leasing, include UK nationwide delivery and AA or RAC Roadside Assistance cover for peace of mind. 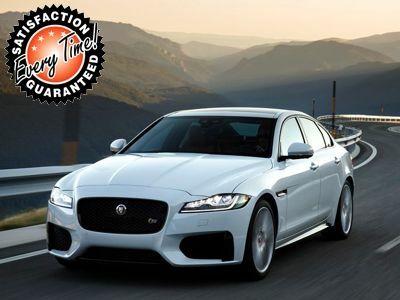 Time4Leasing can offer you the latest Jaguar XF lease deals at lower prices because these vehicles are exclusive and offered at lower rates to customers that have good, poor or even bad credit history score ratings. As you might expect of a former What Car? Car of the Year, there’s not much to criticise. It’s a little disappointing that the 2.2-litre diesel versions aren’t a little bit cleaner, but they're the cheapest XF models to buy and run. Even so, we'd still point you in the direction of the 3.0D V6 - its epic pace and superb refinement suit the XF perfectly, and it’s cheaper than the more powerful S version. Prices may look a little on the high side, but this is largely explained by the generous equipment list. Even the entry-level SE model comes with part-leather upholstery and an automatic gearbox, while the next rung on the ladder – Luxury – is so well kitted that there’s no need to go any higher. There’s a huge range of options available, including a rear-view camera and adaptive cruise control. You can also choose from a particularly wide selection of exterior colours and interior trim. There are 60 Jaguar XF Lease Deals on Offer.